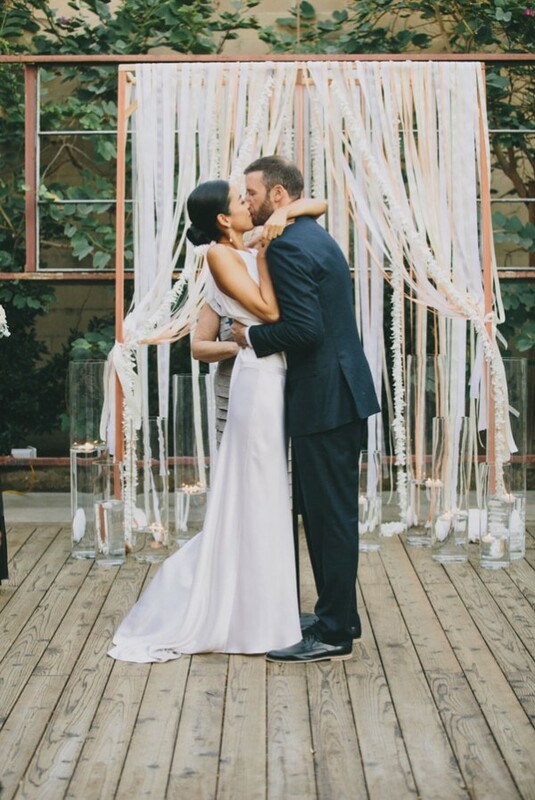 Hard to imagine a more chic wedding! 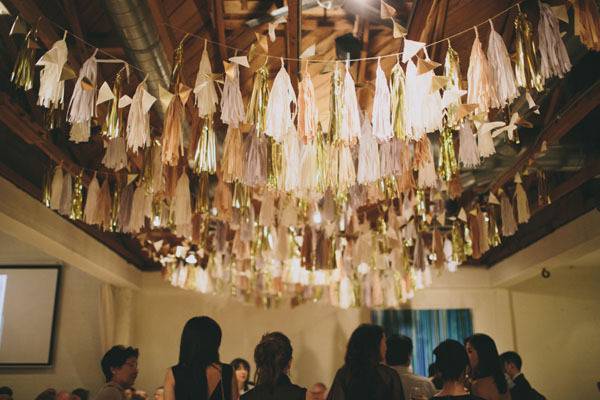 From the brides dress to the bridal party, and right down to the fringed ceiling at the reception, its perfection! The most difficult part in planning our wedding was finding a venue within our budget. We searched everywhere in LA, Palm Springs (where we got engaged), we even flirted briefly with the idea of Mexico, one of our favorite weekend getaways. We finally found this hidden gem in an industrial stretch of town east of the Silverlake reservoir, The Elysian. It was a former artist’s residence and studio, so the indoors had a clean, modern, minimal look. But then it opened into a spacious and rustic outdoor area and garden. 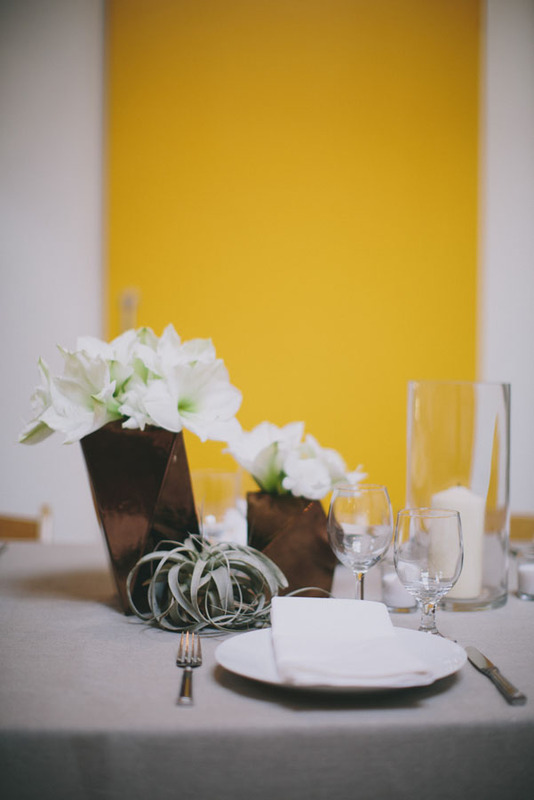 We really liked the indoor/outdoor element, and the space was ideal for a small, intimate wedding. 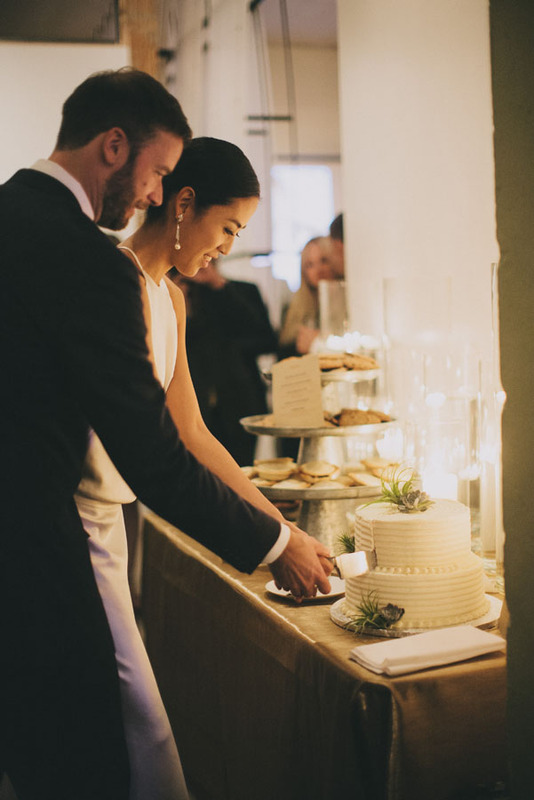 After we we found the venue and our lovely and efficient wedding coordinator, Kayla Ton, everything – the design aesthetic, food choices, program – flowed from there. Pizza being one of our favorite foods, we hired Urban Oven to do our dinner and dessert. Urban Oven runs a food truck with a mobile wood fired pizza oven! Scott, the owner, created a rustic, family style Italian menu of cured meats and cheeses, salads, grilled vegetables, and artisanal pizzas. Dessert was a buffet of brownies, cookies, and mini pies. We had the amazingly talented Jamie from Rad and In Love as our photographer. She has such a warm, calm presence. She was unobtrusive but took so many beautiful shots and really captured the feel of each moment, and she’s just a cool gal. Yorikobo Photo kept the party going with their modern, space age photo booth and props. The rest of the wedding was handled by our brilliant coordinator, Kayla, and our incredibly generous and creative friends. 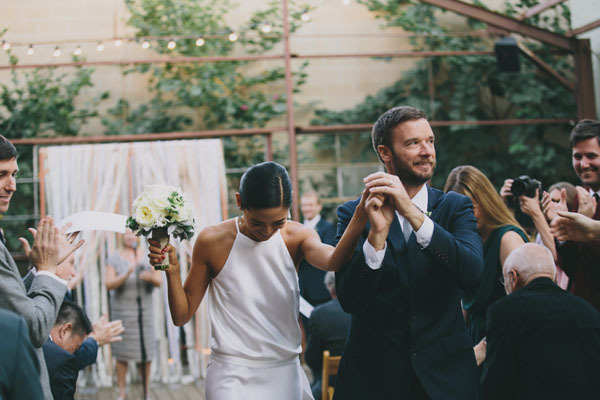 Our dear friend and groomsman, Phil, offered to DJ and he lugged crates of records all the way from New York. All of the signage and graphics were done by our New York graphic designer friend, Laurie Fink. 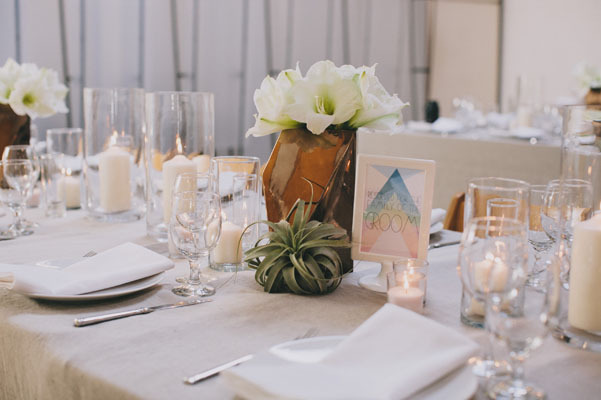 Our friend Ashley Tearston, who owns a special events company here in Los Angeles, Floracopia, took care of ALL decor, florals, and furniture rentals. 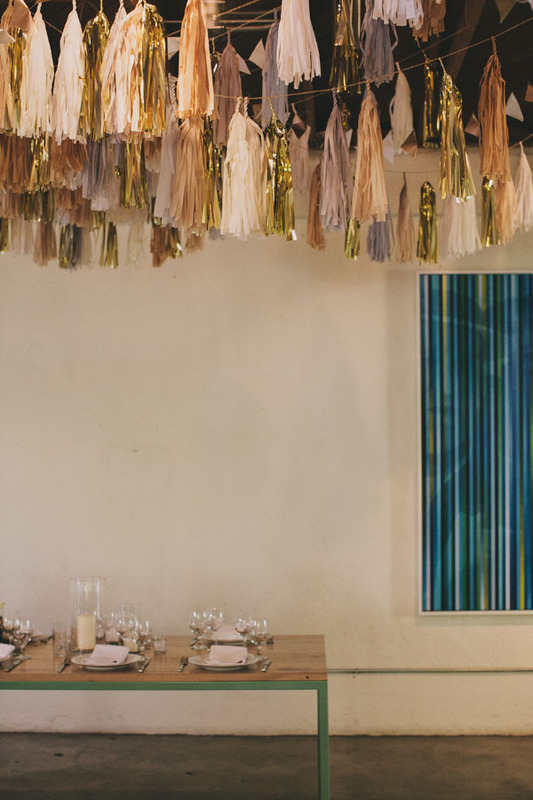 She has incredible taste and tons of experience, and she really helped guide the look and feel of the space and ceremony (plus, she was doing everything while newly pregnant!). 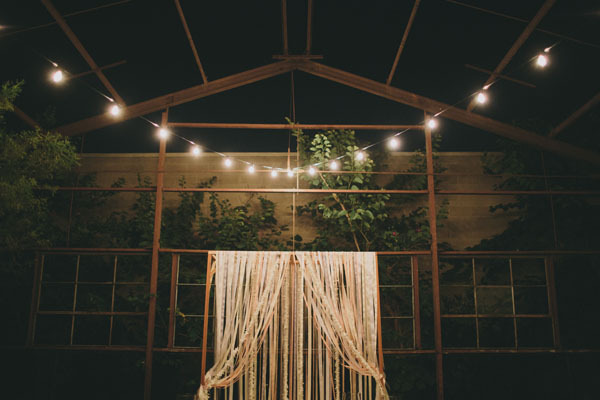 Drew, my husband, tackled a couple of DIY projects and built the ceremony arbor and the light installation. And a close family friend, Claire, officiated the marriage ceremony. She has known Drew since he was a young boy, and her words and presence made the ceremony so personal and special. We also had a group of friends organize and prepare a casual brunch at our house the next morning, knowing that we would be too tired to get it done ourselves. It was really nice to see our guests after the ceremony, hanging out in our yard and swapping funny anecdotes from the night before. I don’t have a single favorite memory of the wedding, but some snapshot moments that make me smile – all of my sisters and I in the bridal suite at the Figueroa Hotel, gossiping and getting our hair and makeup done; walking down the aisle with my father, looking at husband to be, surrounded by faces from all of my years in life; having a quiet moment with Drew down by the Los Angeles River right after the ceremony, absorbing it all in and then seeing two ducks swim by! (a good luck wedding symbol in Korean culture); dancing to Sam Cooke’s “Bring it on Home to Me” and feeling so in love with my man and thinking how I lucked out because he loves to dance; and having our guests over for brunch the next day, where we could have quality time with everyone before they flew back home and hear about all of the wedding details we missed! 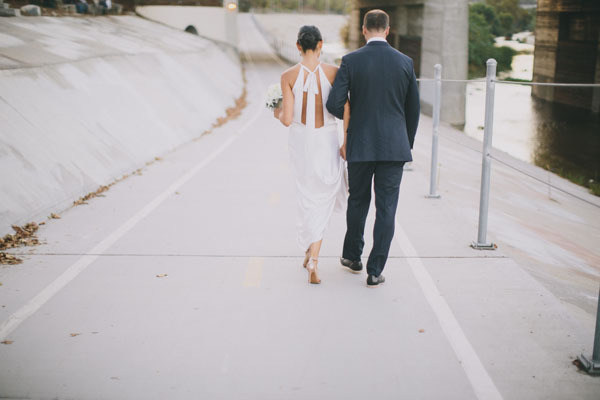 Some advice I would give to brides: It is true when brides say it goes by SO quickly. 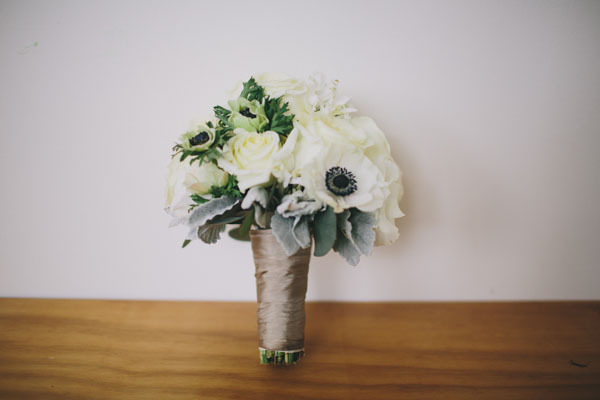 So luxuriate in and try to enjoy every little moment instead of worrying about the details, from the time you get up in the morning and get ready with your bridesmaids, to the ceremony and reception. You plan for months and it is over in what feel like minutes. Also, trust your team! Honestly, before I got engaged, I really did not have specific ideas of what I wanted my wedding to look like (I thought I would elope in some exotic locale). And I was not the type of bride that was going to be up all night sewing table runners and going DIY crazy. 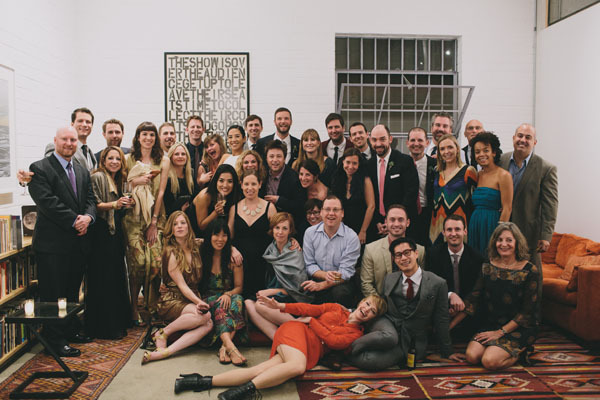 Once the wedding planning got rolling, we just hired people whose work we loved and trusted. We gave them a few ideas about what we envisioned for the evening, and they took it from there, and it turned out awesome. It was definitely less stressful for us to not micromanage and just have time to enjoy the process. Friends also extended their help and expertise, and we took it. Oh, and hire a coordinator if you can! Amazing pictures!! Love that dress! Wow! Just love her dress! Nice photos,what a beautiful wedding! Gorgeous and stunning. Love her dress. Stunning! 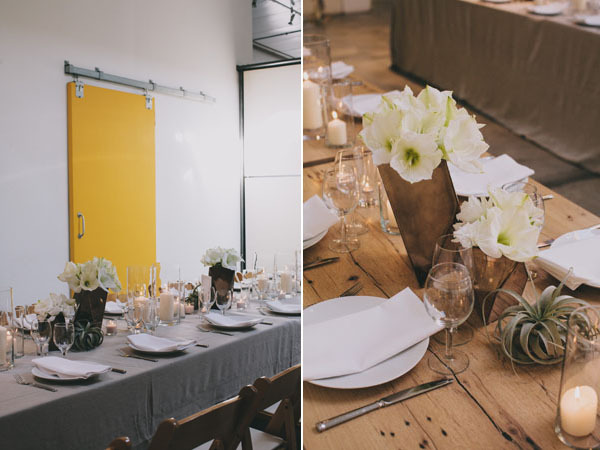 We love the cozy and lovely celebration, just gorgeous! Where is the dress from?? I’d love to know. classic and beautiful. I love the lighting. 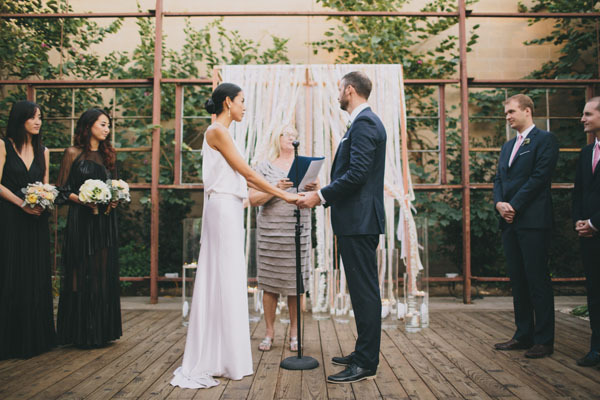 Did they have an officiant? Simply amazing. 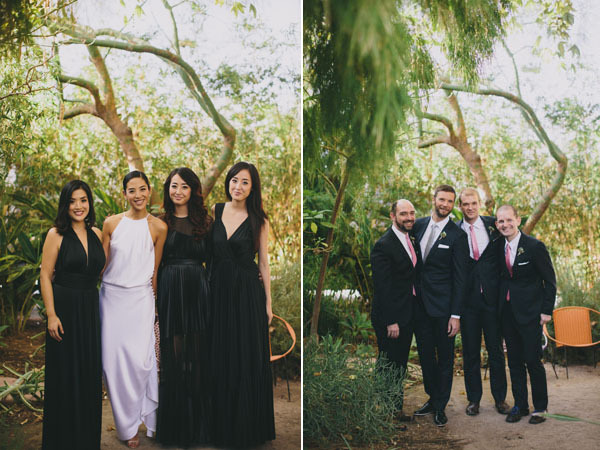 Love the style and elegance of the wedding. We love Jamie! Such a great photographer.